Australia’s consumer transport market is experiencing significant transitions as a power shift from the taxi plate owners, formerly holding the monopoly, to the driver regaining power by becoming their own boss. Recognising this transition phase, innovative on-demand vehicle-subscription provider, Splend, continues to disrupt who is in the drivers seat, launching Rent-to-Own – a first-to-market service enabling ride share drivers to own their vehicle, while freeing taxi drivers from working for the plate owners gain. “Of the 68,000 taxi drivers in Australia most work for a ‘network’, ‘owner’ or ‘operator.’ According to Roads and Maritime Services of NSW in 2012, on average these drivers were paying a lease of up to roughly $1250 per week to rent a licensed taxi because they could not afford a previously inflated $400,000 taxi plate. The plate owner claims 60-65 per cent of the shift takings while drivers endure poor working conditions and unfriendly shift hours,” says Chris King, CEO of Splend. High fares and the skyrocketing value of taxi plates ensures big returns for the big players who own multiple taxi plates, but taxi passenger numbers are in decline and drivers’ wages have collapsed with the introduction of ride sharing. With the shift toward a cashless society, the earnings from taxi driving isn’t as attractive anymore and a transition is occurring to ride share where drivers now have a chance to succeed independently as their own boss. A leader in compliant vehicle supply for on-demand services, Splend launched Rent-to-Own in response to the increasing number of ride share drivers who are eager to work towards ownership of their greatest asset – their vehicle, but who do not want to go into debt by financing a car through a bank or broker. The big appeal for drivers to shift into Splend Rent-to-Own is no lock in contracts meaning members can walk away at any time as opposed to feeling trapped into long term financing. The vehicle-as-a-subscription fee for Splend Rent-to-Own starts at an average of $279 per week over four years covering registration, compulsory third party and full comprehensive insurance, scheduled servicing as well ride share training courses. The weekly subscription cost decreases by $50 each year, helping members achieve car ownership sooner. Over four years, this is an added saving of $6,349 with zero interest compared to car financing through a bank or broker. According to the August 2016 Transport Affordability Index by the Australian Automobile Association, in 2013-2014 motorist road related taxes and charges totaled almost $28billion including purchasing costs and expenses of running a car over its lifetime such as registrations, insurance and stamp duty. “The vehicle finance landscape in Australia is expensive and outdated for aspiring ride share drivers. The latest vehicle ownership index figures have huge impacts to the average household income and Australian’s are looking for alternate ways to efficiently earn a living and own a car, making value for money Splend’s main consideration in its Rent-to-Own offering,” said Mr King. As platforms like Uber become more accepted, Splend Rent-to-Own will be an attractive option for drivers looking to build a long-term career in the on-demand economy while saving thousands of dollars in interest charges. In Australia there are currently 31,000 Uber drivers enjoying flexible working hours – 868 of those Splend members who enjoy greater earnings compared to their taxi driver counterparts who are losing out. “I predict a large exodus of taxi drivers who will become disgruntled with low wages, long shift hours, high leasing fees and no equity to show for it. Why should the plate owners who earn money in their sleep undercut drivers? Splend have created an encouraging community of motivated, small business individuals who are all working toward owning their own vehicle while driving for ride share,” says King. Visit www.splend.com.au to become your own boss, work your own hours and own your car outright for total independence. 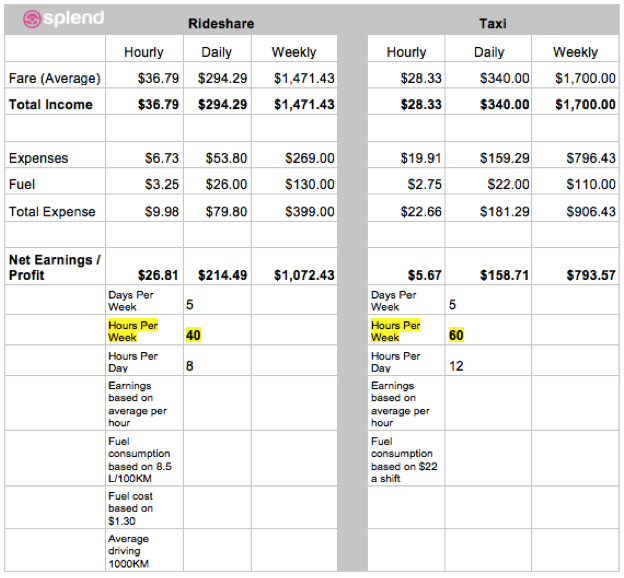 See below comparison chart on driver earnings from our case study, a former Sydney taxi driver who has converted to Splend and been driving for ride share for 6 months. Data collected on 30 September 2016 and represents a Splend member driving for Uber at 40 hours a week compared to the same taxi driver previously driving 60 hours per week. Start-up company Splend has become Australia’s leader in vehicle supply for on-demand services, providing new employment opportunities for over 868 Australians (as at September 2016) and a fresh take on vehicle management. For small business individuals who can’t afford to finance their own vehicle Splend is a fully serviced vehicle solution that comes with a mentoring team to help Members become their own boss. Full service vehicle provider with no lock in contracts: From $279 per week on average over four years, Splend members have access to a new 5-star ANCAP rated vehicle that is in line with ride sharing regulation including registration, stamp duty, insurance and servicing of a vehicle they will own after four years. Easy entry – To be eligible, drivers are required to be a rideshare driver for just a minimum of eight weeks. Ready to ride pack: On top of the brand new vehicle, this includes; 12 replacement tyres, 3 front and rear wheel alignments, 12 replacement brake pads, 12 replacement brake discs, 9 replacement windscreen wiper blades, 2 replacement sets of replacement headlight globes, 1 replacement battery. Member Benefits and Rewards: Members are incentivised with rewards for referrals and if they are measured the safest driver by utilising the latest telematics technology installed throughout the Splend fleet. The Member Support Centre offers a mentoring program to help achieve the highest ratings plus 24×7 Car Breakdown Assistance. Flexible lifestyle: Becoming their own boss means building their own business on their own flexible working hours and working toward car ownership.